The PCOM Library announces a new information service focused on very recent trends in medical research. The new service kicks-off this month featuring radiology, brain/neurosurgery,cardiology, dementia/memory impairment and cancers of the breast, lung and prostate. 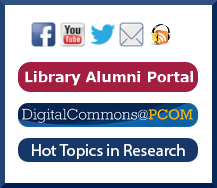 The collection of hot topic articles is accessible directly at https://library.pcom.edu/category/hot-topics/ or by linking from the “Hot Topics in Research” button on the Library’s homepage. Articles are presented in abstract form, with easy links to the full-text versions for detailed research information. If readers have other suggestions for future monthly hot topics in medical research, please send an email to PJ Grier, associate director at: PJGrier@pcom.edu.